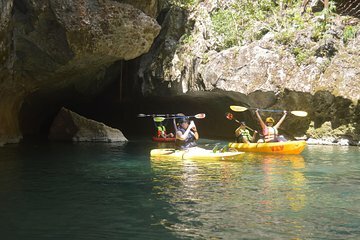 Navegue en kayak a través de los sistemas de cuevas antiguas y vuele a través de la selva tropical de Belice en esta aventura al aire libre de la ciudad de Belice. Viaja hasta el corazón de las montañas mayas, donde navegarás en cuevas misteriosas escondidas a lo largo del río Caves Branch, usando un faro para explorar formaciones rocosas fantásticas. De vuelta a la luz del día, prepárese para un vuelo lleno de adrenalina a través del dosel de la jungla en un circuito de tirolesa de 7 cables que cruza el río para una emoción adicional. Hace una gran excursión en tierra para los pasajeros de cruceros. The experience was great, the tour guides were awesome and super helpful. Even with our difficult figuring out the kayak the guide was very patient. Over all it was great. We ended up going cave tubing, rather than kayaking, and it was amazing!!! Our tour guides, Jeremy and Abner, were the best, and so informative and knowledgeable about Belize and its history. The ziplining was also super fun, and they made sure we were safe at all times. I highly recommend this tour, it was worth every penny and we can't wait to go back!!! Very informative and entertaining tour guides. The caves were amazing! Amazing tour. Kayaking was definitely a better option than cave tubing. More control of what you see and a lot more fun! This tour was booked through VIV tours. The water tender from our cruise ship was late getting into Belize City due to rough seas. Once we got into the port, I contacted a member of VIV. I believe her name was Carmen. I told her we booked the kayak zip line tour. She told me the bus had already left. Carmen made a quick phone call. She said she would drive us to the bus which had pulled over to wait for us after the phone call. After a ten minute drive, we met up with the rest of the tour and continued to the park where the caves were. We zip lined on six separate lines. FANTASTIC! The guides were friendly, funny, and helpful. We then did the cave tour on kayaks. We were then fed a traditional rice and beans, and BBQ chicken dish. Delicious. This was by far our best excursion on this cruise. The tour guide was great, safe, and responsible. This company VIV Tours had excellent customer service and I would highly recommend them.